Welcome yourself to luxury living with this contemporary bedroom set. 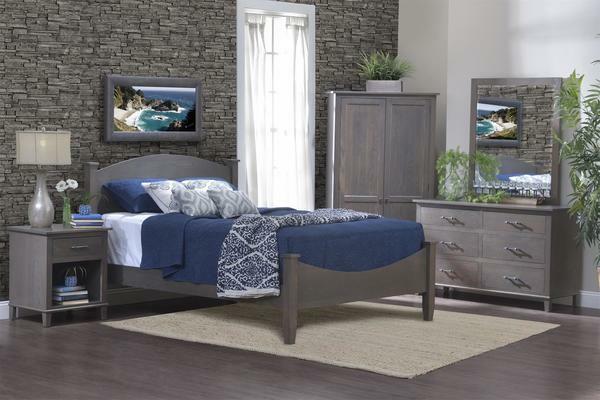 The Hamilton Five Piece Bedroom Set is attractive and versatile, offering a cozy bed, and three bedroom storage pieces. This entire heirloom bedroom set is handcrafted by skilled Amish woodworkers in the heart of Ohio. Select a domestic hardwood and finish color to start your order today! Check out the pieces included in this solid wood bedroom set below. If you have any questions or customization requests, please call our toll free number - 866-272-6773. You will be put in touch with one of our Amish Furniture Specialists who will be happy to assist you in any way they can.